The deadly collapse of two houses in Marseille has traumatised France’s second city in a way that eerily echoes London’s Grenfell Tower disaster. 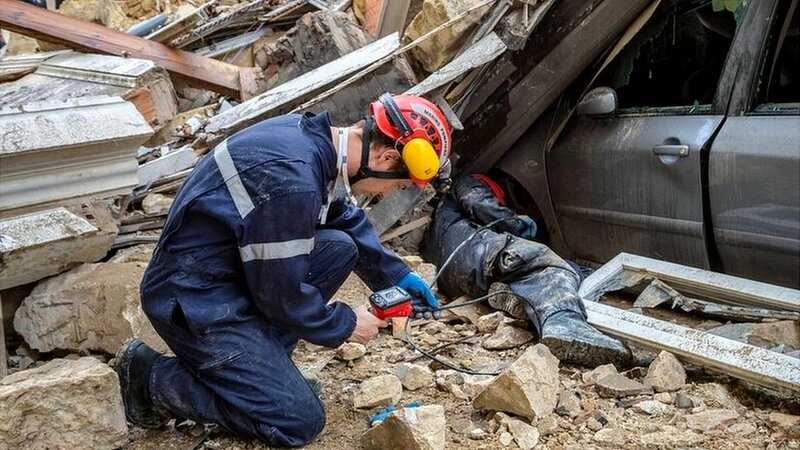 The full horror emerged only gradually, as firefighters painstakingly searched the rubble, while government ministers visited the scene and national TV and radio channels covered the disaster exhaustively. Day after day, bodies were recovered and by Friday an eighth victim was found. Fewer people may have lost their lives than the 72 who died at Grenfell, but the disaster exposed a long-standing housing problem that affects some 100,000 people in private accommodation in Marseille, according to a 2015 government report. And there is heartbreak over lives cut short, and fear, and fury. Where did the buildings collapse? Rue d’Aubagne is a long, busy, ascending street in the old city that leads off the Canebière, the great avenue which forms an axis between the cramped northern quarters with all their economic and social problems, and the prosperity and elegance of southern Marseille. The street winds through the traditionally working-class quarter of Noailles, where much of the population are immigrants or their descendants from France’s former colonies in North Africa. Other residents are drawn to the quarter by low rents. But some Marseille people may know the Rue d’Aubagne best as a street to take from the Canebière to reach the clubs and cafes of the popular Cours Julien quarter nearby. A silent march was due to take place in Noailles on Saturday. Who died at No. 65? The victims have been recovered from the rubble of No. 65, a privately owned building. Of those identified, only the first names are being reported officially. The building collapsed around 09:00 (08:00 GMT) on Monday along with No. 63, which had been bought by the city and was officially uninhabited. Rachid, who lived on the first floor of No. 65, had nipped out to buy cigarettes when he saw his building vanish in a cloud of dust, according to local newspaper La Provence. Inside were two friends he had invited to stay over, one a Tunisian named Taher who was 58, and the other an Algerian called Chérif, who was 36. Taher’s body has been identified while investigators are trying to establish whether that of another man is Chérif’s. The fourth and top floor of the building had been inhabited by a woman of 55 called Marie-Emmanuelle. On the second floor lived an Italian woman named Simona, who was 30. Simona Carpignano, to give her her full name, had recently completed a course in economics at Aix-Marseille University. Family and friends attended a Mass for her at a church around the corner from Rue d’Aubagne, her friends remembering her joie de vivre. An Italian national of Senegalese origin, 26-year-old Niasse, had spent the night in her flat and was also killed. Sharing the same floor of the building was Fabien, 54, a painter who was a popular figure in La Plaine, another centre of Marseille night life further to the south. One of Marseille’s most famous rock bands, Moussu T e lei Jovents, paid tribute to its “friend” and “comrade” on Facebook. A 30-year-old worker named Julien, who lived on the first floor, was also killed. The body of an unnamed eighth victim, a woman, was recovered on Friday. The day after the disaster, a man could be seen playing Brazilian music in mourning for a friend killed in the building, journalist Margaïd Quioc tweeted. How safe are Marseille’s old houses? According to the 2015 government report, 13% of Marseille’s private housing, accounting for 40,400 homes for some 100,000 people, was potentially sub-standard. The average for France was 6%, Le Monde newspaper reports. In the centre of Marseille the number of such dwellings rose to more than a third (35%), and nearly 70% of the homes deemed potentially sub-standard were in co-owned properties such as No. 65 Rue d’Aubagne. Fabien Cadenel, who has worked as an architect for 20 years in Marseille, believes a disaster such as that on Rue d’Aubagne was inevitable in a city centre with so many buildings between 200 and 300 years old, built of rubble stone and mortar. He posted photos this week of structural problems in buildings, while offering advice and reassurance to anxious tenants and landlords. “Maintenance costs money but if you wait, you expose yourself to major works or a tragedy that will cost you infinitely more,” he says. He said anyone with serious concerns should report faults to the mayor’s office or other professionals who had an obligation to investigate. And on Wednesday alone Marseille’s city authorities reportedly received 51 alerts about buildings at risk and responded 37 times, ordering four evacuations. The 2015 report recommended designing a formal strategy to address the problem, involving the city and French state, but the report’s author, Christian Nicol, told Marsactu this week that “the state and the city are not doing their work”. “They’re still at the studies phase of knowing who does what,” he believes. Some 100 protesters gathered near the disaster site this week, hurling insults at Marseille Mayor Jean-Claude Gaudin and the city’s top housing official. Mr Gaudin defended his administration on Thursday and called for laws to make it easier to force landlords to carry out necessary maintenance or make improvements. But critics counter that other French cities spend more and fare better, while Marseille prioritises urban renewal aimed at attracting tourists and business. Fabien Cadenel believes landlords cannot be left to solve the problem of substandard housing alone. “The poorest quarters are the most dilapidated but by definition they also have the landlords with the least means to renovate,” the architect says. The exact cause of the Marseille collapse has not yet been confirmed. But Interior Minister Christophe Castaner has promised that the state will make an audit of “substandard housing” in Marseille, “building by building”.